San Francisco, CA (Jan. 13 to 15, 2019): The Annual Winter Fancy Food Show (WFFS) once again commenced on Sunday, January 13, 2019. With a total number of exhibitors numbering 1400 and total square footage of 230,000, the WFFS has now become the largest marketplace devoted exclusively specialty foods and beverages in North America. The Specialty Food Association (SFA) is the engine behind the WFFS and the show was established in 1952 making this year's show the 66th edition. Today, the SFA has more than 3,800 members and helped launched household companies such as Ben & Jerry's, Stonewall Kitchen, Walker's Shortbread and ZICO Coconut water to name a few. The newest trends in 2019 as highlighted by the WFFS are as follows: 1. Dairy-free alternatives beyond almond, soy and coconut milk; 2. Grilled, fresh and mixed-milk cheeses; 3. Bone broths and 4. Lambrusco and other adult beverages. One of the highlights of this year's show is the seventh annual 2019 SFA leadership Awards. The 2019 winners were: 1. BUSINESS LEADERSHIP (for advancing best practices in the food industry): Miyoko Schinner of Miyoko's Kitchen since 2014; 2. CITIZENSHIP (for improving lives of people and communities by advancing environmental and social sustainability, knowledge and practices): Lisa Curtis of Kuli Kuli Foods since 2013; 3. VISION (for pioneering new approaches, innovative products and business models that have set in motion positive change and progress): Patrick Mateer of Seal the Seasons since 2014. Like past WFFSs, this year's showcased specialty dishes from international exhibitors such as Japan's Wagyu beef, Germany's Berlin cuisine (calf liver with onions) shown in a live cooking demonstration, Italy's cheeses, truffles, oven-warm pizza and aged balsamic vinegars, Spain's Iberico pork and for domestic exhibitors California's caviar and Nueski's sausages and bacon have been annual regulars. 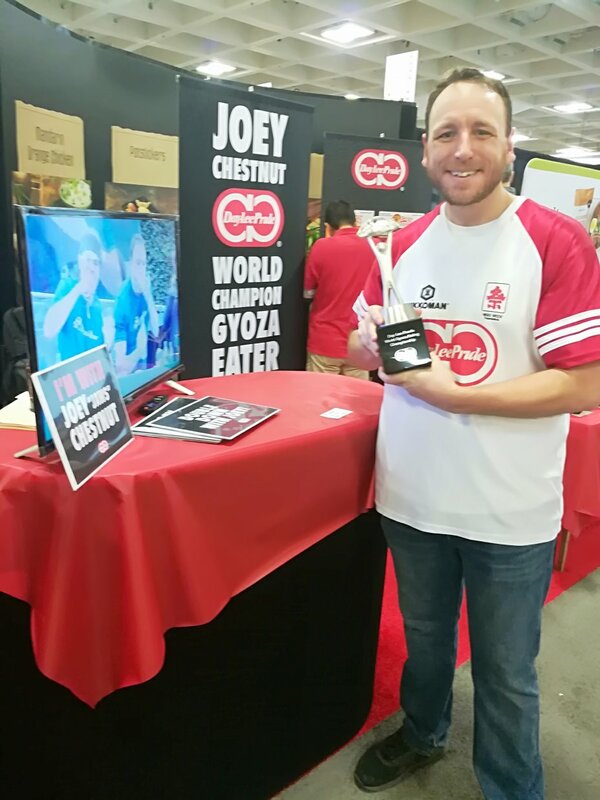 Finally, Hotdog eating champion, Mr. Joey Chestnut, was showing off his hardware at the Kikkoman booth after years of gruelling eating competition on both eastern and western seaboards. (All texts and photographs by Rene Zamora, Reporter and Photographer, Newsmexx TV, Henderson, Nevada, USA). What kind of portal is NewsmexX? NewsmexX is an international media platform for journalists, photo and videographers of the International Association of Press Photographers Inc. The NewsmexX press community posts editorial content online daily including: press photos, videos, news, reports and factual articles. Is NewsmexX really free? Yes. NewsmexX is absolutely free. The members of the International Association of Press Photographer Inc. can upload videos, photos and reports for free .They can communicate with colleagues as well.